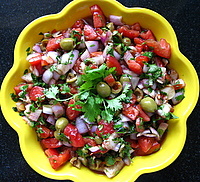 Salsa recipe has got many variations. Salsa means sauce. This Mexican / Spanish recipe will act like an instant flavor booster to your grilled or baked fish, meat or bread. You can serve it with your appetizers or anything really. I am listing here 2 recipes.One is a Tomato salsa and the other is salsa verde meaning green sauce. Mix all the ingredients together and chill in the refrigerator. Serve with grilled meat, vegetables, chicken.......anything really. Blend all the ingredients in a mixer. Pour the puree in a saucepan. Bring it to a boil. Then simmer until thickened. Salsa verde - Green sauce is ready. Serve these salsa with crudites, corn cakes, salads or just about anything.